Gloriously intense colour. 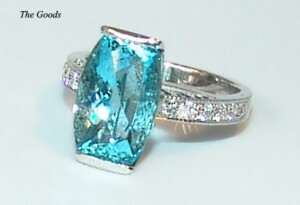 This super fine rare coloured aquamarine of 5.13 cts (hand cut by world famous gem cutter, Steve Avery) is hand set in 18ct white gold with brilliant diamond set shoulders. Contemporary.